Issue #55 • August 16, 2018•Buy Now! My mother finally took the call after midnight, lying on the sheets on her queen-size mattress with me beside her, propped upright on the pillow. The exchange was on speakerphone, quick and emotionless, spoken in an incomprehensible dialect of Chinese. My mother’s responses in Mandarin barely amounted to whispers, but it didn’t make a difference. There was a voice on the other end, and that voice wasn’t expecting answers. After we hung up, my mother placed a hand over her eyes and breathed in heavily through her nose. Eventually, barely moving from her place on the bed, she told me the news: my grandmother—a woman I knew from rare glimpses of my mother’s childhood; from a handful of aging photos; and from her heart, which, my mother said, was made of not gold but of something finer, pure white jade—was dead. Katherine Xiong is a junior at the Lawrenceville School, where she edits for the school newspaper and literary magazines. Her work has been recognized by the Scholastic Art and Writing Awards and has appeared in Aerie International and Write the World. In her free time, she draws comics, stargazes, and leaves origami everywhere. She lives in Princeton. I was nine when I lost one of my grandparents and fifteen when I lost another. In both cases, I remember every detail about receiving the news: the shock, the tears, the hugs, the consolation. What I don’t remember was thinking that one of my parents had just lost one of their parents. Call it selfishness or shortsightedness, I just couldn’t see my parents as anything but parents, which meant that I couldn’t picture them as someone’s child—someone they’d just found out had passed away. 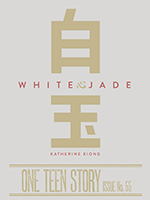 The narrator of Katherine Xiong’s “White Jade” is wiser and far more generous than I ever was as a child or a young adult. She learns in the opening paragraph of her grandmother’s death and then travels with her mother back to China for the funeral. At every step of the way, she observes and listens to and processes her mother, and she’s able to tap into the complexity of emotions her mother is experiencing. No parent is a parent without having once been a child. No parent can resist measuring themselves against the parents who raised them. Between one generation and the next are layers of hopes, desires, resentments, and regrets. Throw death into the mix, and the emotions become all the more tender—even raw. “White Jade” is an incredibly sophisticated and accessible portrait of three women bound by more than just blood. For good reason, it’s one of our Teen Writing Contest winners. We’re thrilled to publish it, and we’re thrilled to introduce you to the work of Katherine Xiong. KX: I actually came up with the title first while re-watching the 2008 Beijing Olympics, where the gold medals were inlaid with white jade. White jade isn’t actually a Chinese equivalent of the “heart of gold” idiom, but it occurred to me that, as it is one of the more valuable types, someone trying to make sense of Chinese culture might mistranslate something like that. It felt like an accurate representation of how a lot of American-born Chinese kids struggle to understand a Chinese culture and extended family they’re not fully immersed in without oversimplifying or ‘Americanizing’ it. The story emerged from that idea. PR: If you had to say who this story belongs to, would you say it belongs to the narrator, or her mother? Whose story is it? KX: I’d have to say the story belongs more to the mother, since it’s her emotional journey that’s at the forefront. She’s the one who grapples with her identity and her relationship to the past attached to it. That past is new to the narrator, whose arc is one of discovery, not of estrangement. But even though the mother participates in most of the “action” of this story, I don’t want to discount the daughter’s experience and how her arc colors the narrative. She’s the story’s emotional interpreter. She gets that power. And because of how she’s discovering her family, she’s also passing implicit judgment on her mother—judgments that may or may not be accurate. Maybe it’s a more passive arc, but I wanted her growth, her judgments, to matter too. PR: One of the beautiful things about this story is that it depicts two mother-daughter relationships: the narrator and her mother, and the mother and her mother (who has just passed away). Were you drawn to how one relationship played off the other? KX: Absolutely. With those two relationships, I wanted to draw on the universal connection between a mother and a daughter while also representing the complexity within each of those relationships. Within the story, each mother expects something of her daughter and the daughter expects something of her mother, and they act based on both those assumptions of who the other person is, and on what they need from the other person. So you have character moments like the narrator examining her mother through her expectations/understanding of her mother’s relationship to her own mother. They’re really interesting cases of knowing-but-also-not-knowing one of the people who’s closest to you. It’s wonderfully confusing. PR: Do you think the relationship between the narrator and her mother has been changed (for better or worse) by the mother’s revelation at the end? Or will they carry on the same as they were before that watershed moment? KX: I think their relationship has always been close, since they’re essentially a unit in America. But they also have one of those relationships where there’s always been a closed door in the mother’s life that both characters have implicitly agreed to respect. Through that dynamic of just assuming the other person is getting the message or assuming that there were things that one just didn’t talk about, the mother lost sight of how her daughter might be drawn to a past—a family, a culture, even—that she never got to claim. Meanwhile, the daughter’s reached an age where she’s seriously started to observe her mother, to want to know and support her. I think that final moment—or even the whole trip—opened that door onto the mother’s life. Now the two of them might finally make sense of their family history together. When I’m procrastinating on those, I’m outlining a fantasy concept about a team of teenagers uncovering a conspiracy about their home and discovering a new one.